Eye: Amber with flashes of mahogany. Nose: Spicy notes of spices, nutmeg. Palate: A cognac with a lot of roundness in the mouth followed by a gourmet note on the finish. This vintage is rich and testifies to the beautiful complexity of the Cognac terroir. 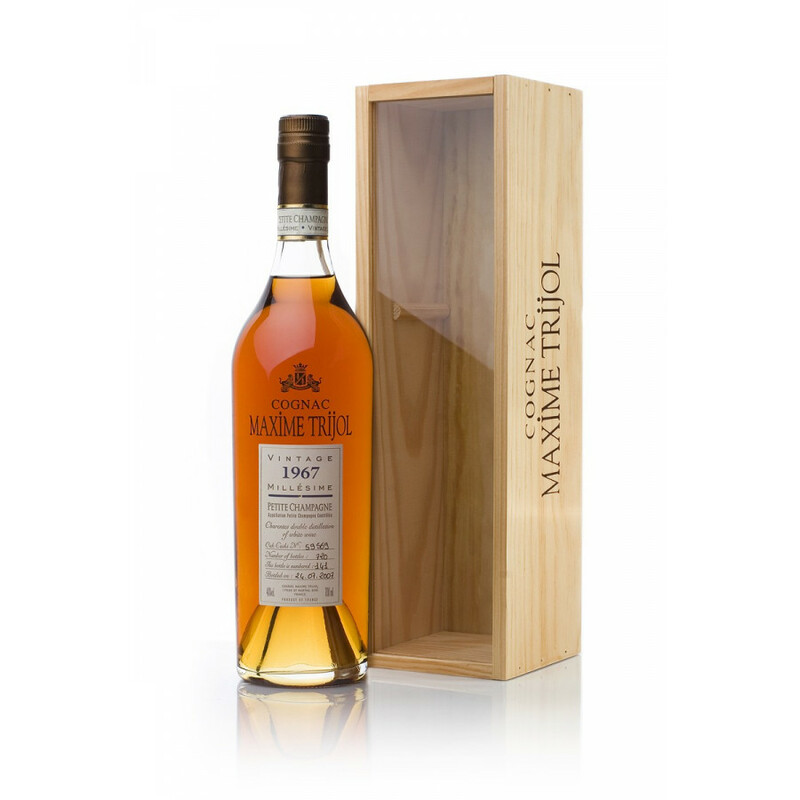 The Maxime Trijol Vintage 1967 Cognac is a sumptuous celebration of the single, slow-ripened harvest of 1967 and of the rich Santonian soil known to the Petite Champagne cru. Aged for 39 years, each individually numbered Millésime has undergone a meticulous creation process, certified by the Bureau National Interprofessional du Cognac authorities to deliver the utmost quality. The result is an exceptional spirit boasting deep copper tones and intensely fruity aromas, which give way to lighter floral notes and a distinctly silky finish. The Petite Champagne is the second part of the Fine Champagne Cognac area, and is known for chalky soil that produces fine eaux-de-vie, takes longer to mature but is worth the wait. This sleek decanter comes complete with Millésime label which lists this fine Cognac’s credentials. Complimentary wooden case depending on availability. This cognac is best experienced neat at 20°C, 25°C (70° to 80°F).